Prepare chips as per pack instructions. Cut barramundi into bit sized pieces. In a bowl whisk eggs, lemon juice and water. In a 2nd bowl, l mix flour, salt and pepper together. In 3rd bowl add breadcrumbs, chopped dill, salt and pepper. Coat barramundi pieces in flour then egg wash and finally breadcrumbs. Do a small batch at a time. Place on tray and put in fridge for 20min. Place fry pan on stove and fill ⅓ of the way with oil. On medium heat bring oil up to hot (test by adding some breadcrumbs to see if they sizzle or you can use the back of a wooden spoon in the oil to see if it sizzles). Gently add barramundi portions to pan careful not to over load pan. Cook for 4-5 min on one side then turn and cook for another 4-5min. Remove from pan and drain on paper towel. 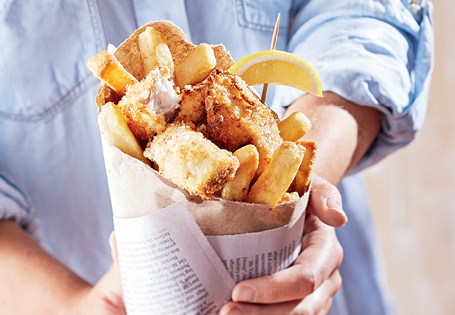 Serve fish and chips with lemon and tartare sauce seasoning with salt and pepper as desired. *Tip: you can make an interesting serving cup by linking a sheet of newspaper with baking paper and rolling into a cone shape. Use this to add your fish and chips in for your guests. **Try using our White Mill Lemon Pepper Breadcrumbs, for an added layer of flavour.